So you are away from home, and you have downloaded something online that your Treo 650 didn’t like or for some UNKNOWN reason, your Treo 650 has started doing an auto-reset loop. Remove the back panel and find the reset button beside the battery carriage area. Press the black button with the tip of your stylus. Try this before going to the “desperation move” of a hard reset. At the very least, it will permit you to use the Treo as a phone while the rest of the Palm portion is having a reset fit. Hold down the “up” arrow on your 5-way navigation button while pushing the reset button on the back (you probably still have the battery cover off from a vain attempt at a soft reset). When the “Palm Powered” black and white screen appears, release the button. This shoots you into the basic phone set up. A hint here — if you need access to a particular program or application, and hitting the menu “home” button starts the reset loop again, you may be able to access it by using the quick launch buttons here by the phone. First, use the down button to scroll down past the “contacts” and other buttons. Find a blank button. Click on it and that will send you to a setup screen where you can specify a particular application to launch from that button. I have mine set go to “SuperUtility” and “Backup” (Backup Buddy) in case of such emergencies. With SuperUtility, you may be able to delete the offending program without doing a hard reset. With Backup, you may be able to recover an accidentally deleted application or essential utility without doing a hard reset. Even if this doesn’t correct the problem, you can access essential information in this manner immediately, and deal with the hard reset and sync issues when you return to the office. Although a hardware issue may mean that this won’t fix your Treo, any software (non-firmware) issue is WIPED clean with this… along with all information you have, all programs and everything else. Once done, you will be holding a “factory direct” model of the Treo 650. Brace yourself for it. Hard reset is a last resort to fix software issues. 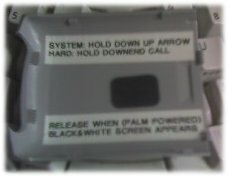 To Hard Reset: Hold down the red “phone” button (the one you use to end calls) and press the reset button on the back of the Treo. Once the “Palm Powered” black and white screen appears, release the button. You now have the option to erase everything on your handheld. This won’t affect your expansion card, but if you say “yes” everything else is gone. GONE, I say! Take a deep breath and push “yes” to hard reset. So, if you haven’t taken my advice on doing backups yet, I’ll bet you will after this happens to you the first time, eh? If you HAVE the SD card backup (and you have a recent version) you will feel very little pain from this process. If you don’t have a backup, you have an extremely OLD backup, or you are away from your computer, you will experience a bit of discomfort. You now have a very basic phone in your hands, without even a phone book (unless you have stored the essential numbers on your SIM card). Now, if you are reading this, you should really do the following: Once things are back to normal and you reinstall all your information on the Treo — GET A SD CARD AND GET A BACKUP ON IT! I usually try to keep a direct link to the better SD card deals on this site under the “Essential Storage” header — look for it. Be sure you have SuperUtility (or a similar program) for troubleshooting in the field. Use CardExport to backup your SD card once a month (I back mine up once a week when I do my full system computer backups and my website backups). The Treo 650 is wonderful, you know I adore mine, but there is seldom a time you will feel more let down by something than when you are holding a blank version of what WAS your all-in-one machine. I call mine my “brain” and if I were ever left with a blank version, well… you get the picture. Best wishes for a happy restore process from a recent backup!